Faster and Louder: Lipstick Homicide v. The Turkletons! Ah, pop-punk! Don't you just love it? Actually, you might not. But I sure do. It was '90s pop-punk that first inspired me to start writing about music all those years ago. And I still love all that stuff. Today we don't have the sheer quantity of pop-punk bands that we used to, but the quality has gone way up in my opinion. 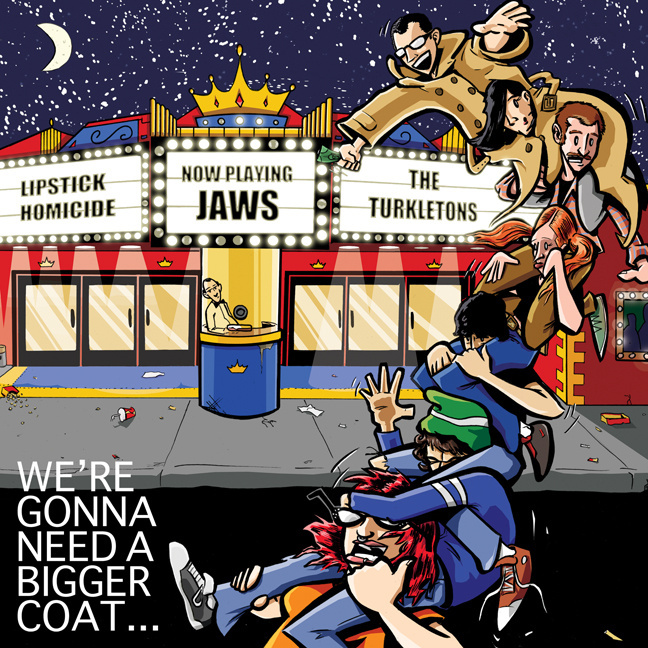 A case in point is We're Gonna Need A Bigger Coat... - a new split 7" on It's Alive Records featuring Midwestern up-and-comers Lipstick Homicide and The Turkletons. My goodness! If I'd heard this record in 1995, I probably would have erected a monument in its honor and issued a 50-page press release extolling the virtues of both bands. It really reminds me of why I fell in love with this kind of music in the first place. Most pop-punk can be classified as either good or bad. But there's an additional category of great - and that's where both of these bands belong! I think what I love best about Lipstick Homicide and The Turkletons is that they fully embrace everything that pop-punk should be about. If you're gonna do pop-punk music, you can't be halfhearted about it. These groups write catchy three-chord songs about love & relationships and whatnot, and perform them with energy and enthusiasm. They're about having fun and creating music that puts a smile on your face. Why are so many people against that? Given my "the poppier, the better" philosophy regarding pop-punk, it's no surprise that these are two of my favorite bands of the moment. In particular, I'm a huge fan of Iowa's Lipstick Homicide. I do have a well-publicized fondness for pop-punk bands with female vocals, but there's something particularly special about this trio. Both of the band's tracks here are high-spirited and totally infectious, driven by gutsy vocals and hooky guitar leads. Think classic Lookout! Records meets Josie and the Pussycats (Yeah, I know!). You'll swear that that's Mike Dirnt on bass! "Not That Easy" is pretty much the perfect pop song. Oh, and they've got a new album out. Expect a full report soon! The Turkletons, out of Minneapolis, make a perfect pairing with Lipstick Homicide. Again, we're talking old school pop-punk that doesn't apologize for drenching you with melody and harmonies. Yet it's still rough around the edges in a totally good way. Imagine early Teen Idols with boy/girl vocals. The guitar hooks are so catchy, and the likability of the vocals/lyrics is off the charts. It's impressive that The Turkletons keep doing splits with phenomenal bands (first Masked Intruder, and now Lipstick Homicide) and have no problem holding their own. Few would argue with the contention that It's Alive is one of the greatest pop-punk labels of all-time. Just look at the bands on its roster! And without a doubt, I'd say this is one of the best records the label has ever put out. This is pop-punk for people who love pop-punk - made by people who love pop-punk. What could be better?